Written by Fiona Lawless on October 22, 2017 in Blog, Sights & Sites, U.S.A.
Last updated October 21st 2018. The number one influencing factor in driving, hiking or camping in Chaco Canyon is the weather. Before you undertake a trip here keep a very close eye on the weather forecast. Actually keep an eye on the weather for at least the immediate 3/4 days preceding your trip as you will require dry conditions to tackle the road and to complete one of the hikes – the Peñasco Blanco trail. Within each “Tips” section below the weather and it’s ability to drastically derail your plans will top the list each time. We actually visited Chaco Canyon twice within a week, due to unforeseen circumstances. Firstly, LE II (Little Elvis II – our van) had another of his episodic maladies! This time it was an electrical issue – the power locks died and the driver’s side door became stuck in the locked position. Jerry was quasi-entering and exiting the van “Dukes of Hazard” style, not quite through the windows but through the passenger door. This dangerous situation prompted us to return to Albuquerque pronto. Coinciding with LE II’s latest ailment, the weather had also taken a turn for the worse. Major thunder storms were about to roll through. We were stymied by a capricious vehicle and some volatile weather. We would not get to complete the hikes we had planned, but we vowed to return under more auspicious circumstances. A week later we returned and redemption was ours. Just making it to Chaco Canyon has been on my wish list for quite some time. I first heard of here when we lived in Albuquerque from 1998-2000; unfortunately work got in the way of life and we never made it there, when it was so much more accessible to us. Now with time on our sides and a very needy vehicle to transport us, we decided to tackle the legendary road that leads to these desolate but awe inspiring ruins and landscape, twice. The reputation of this road precedes it. Although the road to Chaco Canyon can be formidable, with a little planning and some slow, cautious driving, it can be conquered. A high clearance vehicle is recommended but not necessary – depending on the conditions. Like most folk who visit here, I had to ask “why not pave the whole road”? This being a question I’m sure the park rangers are sick of answering – the roads are on private land. There have been ongoing contentious disputes over whose responsibility it is to maintain/improve these pock-marked washboards. These disputes have yet to be hammered out in the form of a smooth paved road. Overall, it is 21 miles from U.S. 550 until you reach the last 2.5 miles of paved road into the actual park. 12 of these miles are of an egregious nature. From 550 North or South turn onto County Road 7900 which is paved for 5 miles. Turn right onto County Road 7950, paved the first 4 miles then gravel and dirt with some washboard rutting for 8 miles. Suddenly there is a sign stating “End of San Juan County Maintenance”, you are immediately aware that this is the end of any maintenance. The next 4 miles is an absolutely rutted, holey, rough, washboard dirt road. The following photos are of this part of the road in dry conditions! Add to this an almost completely washed out concrete bridge/crossing reducing all traffic to one lane. Note the warning sign! The following photos are of this same one lane crossing in not such favourable conditions. After this 4 miles of non maintenance, there is a welcome 2.5 miles of paved road into the actual park. Pueblo Bonito. Worth the Drive! 1.) Keep an eye on the weather. It doesn’t take much rainfall at all to wash out the only public access road in to Chaco Canyon. The last 4 miles of non maintained road are dirt, up to the point it becomes paved again as the official entry into the park. There is also the one lane semi-washed out crossing to consider. Your vehicle could easily become stuck in the mud/ruts and flash floods are a reality. Use common sense, realistically know your vehicle’s limitations and respect the rain! 2.) Although it would be advantageous to have a high clearance vehicle it is not necessary. We have seen smaller cars – “Honda Fits”, “Suzuki Swifts” make it up the road. 3.) Try not to have a pre-existing suspension issue with your vehicle. If you do, learn to ignore the disturbing noises coming from your vehicle’s under-carriage. 4.) It helps to have a little vehicle know-how. 5.) Allow anything from an hour to possibly 2 hours to tackle the road, depending on your vehicle’s constitution and the condition of the road. 6.) Up to the point you enter the park, be aware of open range on both sides of the road. Open range is fairly self-explanatory, livestock is not fenced in, so they may be on the road. You may be responsible for the value of the animal if you hit it! 7.) See tip # 1 again! The following fees are current as of October 21st 2018. $25 per vehicle (non-commercial), providing access to the park for 7 days. $20 per motorbike, providing access to the park for 7 days. $15 per individual travelling on foot or bicycle, providing access to the park for 7 days. All National Parks are currently in the process of trying to implement their “Entrance Fees” being paid by credit or debit card only. They are attempting to eliminate cash payments. I don’t know if this will apply for the camping fees too at some point in the future, but for now just make sure you have the right change required for how ever many nights camping you may do. The “iron ranger” (camping fee box) does not give change. If you don’t have time to take advantage of any of the hikes within the park, there is a 9 mile driveable loop, taking in all of the highlights and providing plenty of photo ops. Parking is at each point of interest. There are pit toilets at Pueblo Bonito/Chetro Ketl, Pueblo del Arroyo and Casa Rinconada. Plumbed toilets are at the visitor centre. Shaded picnic areas are provided at Pueblo del Arroyo, Casa Rinconada and the visitor centre. The only ruins without it’s own parking area is Una Vida, this is accessed from the visitor centre, where there is ample parking. In between Chetro Ketl and Pueblo Bonito don’t forget to take the path with petroglyphs, which connects these two sites. There are 4 backcountry trails and then there is the Una Vida trail, which is a short jaunt from the visitor centre. The backcountry trails take a little more effort and time but they are definitely worth it. You will have access to more ruins and each trail offers it’s own unique, stunning views. I am not including the time it takes to do any of these hikes, as everyone hikes at a completely different pace and it can be quite misleading to put times in. Just make sure you give yourself plenty of time to complete any of these hikes. Each backcountry trail requires you to fill in a “backcountry trail permit/slip”. One copy (green slip) goes in the windscreen of your vehicle. Another copy (pink slip) you carry with you. The original page (white slip) goes in the trail box at the start of the trail. The trail-head is accessed from beside the visitor centre. The trail to the ruins is relatively flat and easy. If you decide to check out the petroglyphs be prepared to do a little climbing, nothing too strenuous but perhaps a little panting involved. Again it is a relatively easy climb, just a little steep in places. One mile round trip trail, including the petroglyphs. The petroglyphs here are some of the clearest in the park. There is also a big flattish boulder just below the petroglyphs that you can clamber up on and comfortably sit or lay back and enjoy the cliff etchings. Access Pueblo Alto trail-head from the Pueblo del Arroyo parking lot. It is probably the most popular backcountry trail as there are options. You do not have to complete the entire loop, rather you can seize the optimal photographic opportunities to portray “calendar-like” snaps of the mega-stars of the site, Pueblo Bonito Overlook and Chetro Ketl Overlook. You can seize your snaps and be back in your car in no time. This is a relatively easy hike. Once you climb up onto the ridge (bench), this is the most difficult part but it is really not that tricky; just take your time. In order to climb up onto the ridge you must squeeze through a slotted canyon. There are essentially 3 trails/options on this trail. At the base of the natural passageway (slotted canyon) you can check out the ruins of “Kin Kletso”, another Chacoan great house. Once atop the ridge (bench) keep your eyes peeled for “shrimp burrows”; evidence of ancient sea life forever memorialised in the sandstone of the region. They are everywhere. The Pueblo Bonito Overlook provides the perfect opportunity for even the most harried drivers to scramble up to in order to seize the best pictures of the “star” of the park. Looking across the Canyon is the South Gap, where multiple roads entered the Canyon back in the heyday of Chacoan Culture. Take the loop trail you will be treated to an overlook of Chetro Ketl, yet another great Chacoan House, with multiple kivas. Kivas are the circular structures in the pictures. They were used for ceremonial purposes. Another striking feature to look for on the loop trail is “Jackson Stairway”. Named after a photographer with the U.S. Geological Survey in 1877, these steep stairs are certainly not for the feint of heart. Hopefully back in the day there were at least some kind of handrails to grasp onto. Naturally the park service does not want anyone trying the stairway for themselves these days. If you take the loop route there will be another very narrow slotted canyon to conquer. Pueblo Alto is situated at 6,440 Ft. in elevation. Both the loop trail and the Pueblo Alto Complex trails encompass this collection of structures built high up on the ridge, with panoramic views of the surrounding landscape. It is thought that this commanding presence was intentional, with the ability to communicate with other great houses far away, also located on natural elevated features. The Peñasco Blanco trail-head is also accessed from the Pueblo del Arroyo parking lot. The Peñasco Blanco trail is relatively easy and flat with a few minor ups and downs until you get across Chaco Wash. If you are just taking the petroglyph trail then it is quite flat. The terrain of the trail is a mixture of dirt and sand. If you plan on crossing the Wash firstly make sure you have had dry weather preceding your trip, as the Wash fills quickly and can be a little dodgy to cross. Once you cross the Wash it is an uphill climb to the “Supernova” Pictograph and even more of a climb if you continue on to the ruins of Peñasco Blanco. This climb is not technical and could be tackled by most. We met a family with two young girls who had made it to the “Supernova”. 1.) The longest trail in the park, at 7.2 Miles round trip if you decide to make it across the “Chaco Wash” to the ruins of Peñasco Blanco. 2.) If you opt for just the petroglyph trail, this is 4.0 miles round trip. The first feature you will encounter are the ruins of “Casa Chiquita” about one mile in on the trail. This trail features an extensive section of petroglyphs along the cliffs. 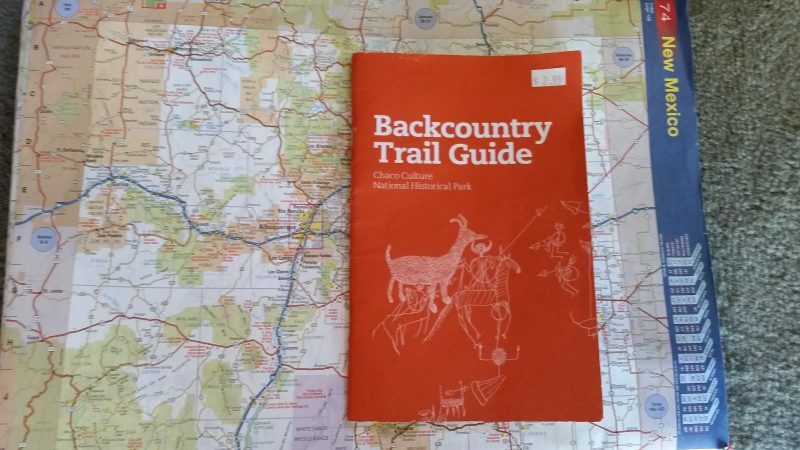 They are well signed and if you have invested the $2.99 for the “Backcountry Trail Guide”, you will be privy to detailed information on where exactly to look and what is is you are looking at. They are a combination of Pueblo, Navajo and European-American etchings. If you make it across the Wash you will be rewarded with a view of the “Supernova’ pictograph (rock painting). Depicted are a star, crescent moon and a human hand. There is also a concentric circle painted in red and yellow. The ruins at Peñasco Blanco provided more incredible views of the surrounding landscape. We were thwarted by the weather and Chaco Wash on our first attempt at Peñasco Blanco. The week prior had seen unusually heavy rain and the Wash was still running very high – 4 Ft. As we tried to assess the Wash and any possible crossing, large thunderstorms rolled in, so we decided to play it safe and hoped to have a second chance another day. The Wash may not look deep in the following photos but they are deceptive. A week later redemption was ours. This is the only trail where you have to cross the Wash, so weather watching is paramount. It is worth it to cross the Wash and continue to the ruins. The South Mesa trailhead is accessed from the Casa Rinconada trail at stop/feature no. 10. There is an elevation gain on this trail but it is not difficult or technical. The trail is well marked and is comprised of dirt, some loose stones and sand. Just take your time. This was possibly our favourite trail. We are torn between this and Pueblo Alto. The views were fantastic. The walk back through the South Gap is beautiful. Wijiji trailhead is located 1.25 miles east of the visitor centre. We hiked in after a not too terribly heavy shower of rain. The photos might provide some insight into how mucky the trails can become in a short period of time. Not too far from the ruins you can follow a short trail that leads to a pictograph of two red animal images and some negative handprints. 1.) Weather! Hiking in a light shower can be o.k. but this is not the place to get caught in a thunderstorm , especially if you are up on one of the ridges (benches). Also the “Peñasco Blanco” trail is the only trail that crosses the “Chaco Wash”. This wash can fill up quickly to a depth of 4′ or more. The mud on the bottom is very slippery. As always don’t attempt to cross flowing water. Ensure you have at least 4/5 days of dry weather before your planned hikes, to allow the ground and wash to dry out. Check the weather forecast before your hike. The visitor centre displays projected weekly weather conditions, with daily updates. 2.) Invest $2.99 in the “Backcountry Trail Guide”, available at the visitor centre. It will be indispensable on your hikes, explaining much of what’s around you. 3.) Make sure your camera is charged. 4.) Sorry for pointing out the obvious, but bring plenty of water with you. Other essentials would be a hat, sunscreen, sunglasses and snacks. Binoculars are handy too if you happen to have some. 5.) Give yourself plenty of time to enjoy your hike(s). 6.) Do not take anything from the trails – pottery, plants etc. You are being watched from afar by rangers with binoculars! You will get caught. 7.) The trails are very well marked. There are cairns strategically placed as markers everywhere. In the places where there are no cairns, the trail is blatantly obvious or is marked by water bars/pans. You may not have to reserve a campsite a year in advance for “Gallo Campground” at Chaco Canyon, but it is an option and most sites are set aside for reservations. There are a combination of 49 sites for both tents and RVs and a further 2 group sites. 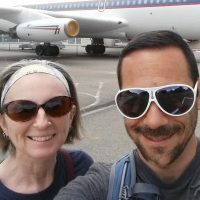 Camping (RV or Tent) is $15 per night. If you are looking for privacy, it is non-existent at the campground. There are neither natural nor man-made barriers between the sites, apart from perhaps a few scrub bushes here and there. It is, however, a very peaceful campground with quiet time being between 10 pm and 6 am. If you are looking to rage it up and party, this is not the place for you. Yes, there are taps by the visitor centre. There are 2 blocks of plumbed toilets on the campground, not to mention the pit toilets located at each of the points of interest on the 9 mile loop drive through the park. All toilets are clean and well maintained, including the pit toilets. Plumbed toilets are available at the visitor centre. If you have a bit of time on your side, come to Chaco Canyon prepared to camp; once you get here at least you will have all the necessary accoutrements to set up camp. We arrived with the intention of it being a day trip, but having finally made it down the road to Chaco Canyon, and wanting to see much more of this captivating place, we made an impromptu decision to camp in a semi-prepared way (more beer would have been good!). Chaco Canyon has become an increasingly popular destination. During the Summer months and early Autumn it can be next to impossible to secure a campsite. As you have seen above there are very few non reservable sites (only 8 in total). During this busy period we strongly recommended you book a site in advance. Click here to reserve a site directly with the campground. 1.) Sorry to be repetitive, but again the weather tops the poll. 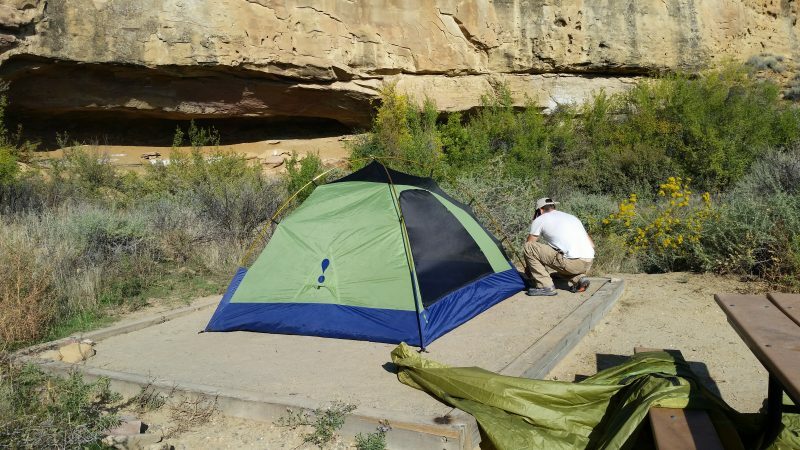 The tent sites have a small raised, sand filled platform to place your tent, but even a small amount of rain can result in a deluge of run-off from the surrounding cliffs. 2.) Avoid Campsite # 4. All sites have their own wee trail (pardon the pun) to the bathroom, but for some reason campsite # 4’s trail has become the shortcut, general all-purpose trail to the loo. Take it from our own first-hand experience of this site. Fellow campers lose all sense of etiquette and traipse through this site like a herd of lobotomized elk. Somehow they were oblivious to the large maroon vehicle with an orange blaze kayak on top parked at the site! Campsite # 4’s “General Public” trail to the Toilet! 3.) If there is a sign up saying “Campground Full”, check with the campground host anyway. There are a few first come first served sites, you may get lucky and get one open (hopefully not site # 4), but hey, beggars can’t be choosy. 4.) If you think you might camp, bring firewood if you want a campfire. You cannot gather firewood here. 5.) Bring some extra blankets and warm clothes. It gets very cold here at night. We had frost on the inside of the windows of the van. 6.) I know I just said come prepared to camp, but I also recommend not paying for too many nights in advance. Things can change – weather/your vehicle may become temperamental. There are no refunds for leaving early. 8.) If your preference is a lovely moonlit stroll, you couldn’t pick a better place under a moonlit sky. The illumination is amazing with just the light of the full moon. 9.) Get up early. The gate to the loop trail opens at 7 am. You may see herds of elk grazing, especially at dawn and dusk, though they can be seen throughout the park during the day. 10.) Campsite # 44 is the pick of the site, in my humble opinion. It is a tent site only and it is non reservable. It is one of the more somewhat private sites with a cave-like area behind it. Every Friday and Saturday evening from April through October, the park features a programme highlighting the night sky at Chaco Canyon; depending on staffing this “Dark in the Park” talk may also be held on Tuesday evenings. The visitor centre has a list of available walks, talks and audio visual programmes on offer for the foreseeable week. Naturally, due to the increase/decrease in daylight hours, the “Dark in the Park” talk time changes on a weekly basis, check with the visitor centre for current times. This very informative and entertaining talk comes with a strong Drifter’s recommendation. It is presented by Ranger J.B. who actually set up the astronomy programme in the park and who is a wealth of knowledge on the night sky here. After the talk three telescopes are set up, including one in the observatory. They are ready to guide you and your eyes on a galactic journey through the lens of each telescope. Allow up to two hours for the talk and the hands-on telescope time. Hopefully this piece will serve as a comprehensive guide to anyone interested in driving to Chaco Canyon and potentially hiking and/or camping once there. There is information out there but it is difficult to get a sense of the road’s condition. Chaco Canyon is an intriguing place that subtly lures visitors with it’s mystical ruins and peaceful solitude. Add to this the shifting colours of the sandstone cliffs as the sunlight strengthens and wanes. Throw in the fantastical and whimsical rock formations that have been whipped, gouged, cajoled and caressed through millions of years of wind/rain erosion, and you have one captivating landscape, begging to be explored. Love this post! I had the chance to visit Chaco a couple years ago and just loved it. Did not make the Penasco Blanco Trail, but did manage the entire Pueblo Alto and South Mesa loops. Sea fossils are amazing on the Pueblo Alto trail, including cool impressions of mollusks, along with the worm trails. Jackson Stairway – definitely not possible! In fact, the handholds (prior to the “steps”) were specifically designed so that if intruders tried to climb the wall, not knowing the exact order of which hand or foot to put there, would get to the top, not know how to proceed, and fall down. Eek! Per a ranger’s suggestion, I did the South Mesa Trail “backwards,” and thought it worked nicely. The protected spots along the way, just above the South Gap. looked to me like prehistoric campsites. I remember seeing lines in the rock from sharpening of tools. Maybe there was some info in the Backcountry Trails book. (I should have gotten it!) Loved the view of Shiprock (waaaay in the distance, faint on the horizon) from Tsin Kletzin. You make it seem like you were there just the other day, along with us! You taught us something about the Jackson Staircase; that information was not in our backcountry guide, so thanks for that! We certainly recall seeing some of the little things you mention, like the score marks in the rocks where tools were sharpened. We are both so happy you enjoyed Chaco Canyon as much as we did; we could have spent weeks there re-hiking all those trails and taking in all of the views along the way. When were you there? Thanks again so much for reading this post and sharing your experience of Chaco Canyon. Thankyou for sharing great photos of stunning scenery. Thanks D and Susie for your support. Tomorrow (Oct. 30th) we finally cross the border into Mexico and we can’t wait. Hopefully there’ll be even better photos to follow. Finally the kayak will see some water! You get some strange looks driving through the desert with a kayak! Fiona, what a fascinating and informative post. This was very informative and gives you a feel for how remote the Chaco Canyon is . I also was amazed by the photography. Fiona, being you are an Archaeologist this is a dream come true for you, I know Jerry loves this as much as you. Safe travels you two drifters. They say getting there is half the fun! It is certainly true. I have always wanted to visit this place, but it never happened when we lived here in New Mexico. We are both so happy to have the time to do it now. The hikes were amazing and so was the scenery along the way. I am glad you enjoyed the photos. Thanks again for following and sharing! Wow. Just wow. Fascinating and informative! Love the muddy boot details. Your stories are really fun guys. As you can see, you must keep an eye on the weather at Chaco Canyon. It really is a beautiful place and one of the less visited corners of the state, for some rather jolting reasons! Thanks again Dave for reading and enjoying our posts. Hello and Love to everyone at PWM! Thank you for taking us on this journey. Sean and I will add it to the list of “Need to see places”. Maybe if I’m lucky, I will get to Ireland first, so that we can roam the land of my ancestors. We hope you make it to Chaco Canyon next time you both are out west. Just be prepared! You will love Ireland…it is only a 6 hour flight from the east coast. If you need any tips on Ireland, just give us a shout! Thanks again for following our blog. We really do appreciate it! Thanks for hanging in there and reading such a lengthy piece. The hikes (and the night skies) were indeed worth every struggle to get there! Next time we are in Pennsylvania you will have to show me your favourite night-time sky. We have yet to use the umbrellas and hope the only use they get is for sun-shade on the beaches of Baja! Jerry was quite proud to have fixed the van…he learned from the best.